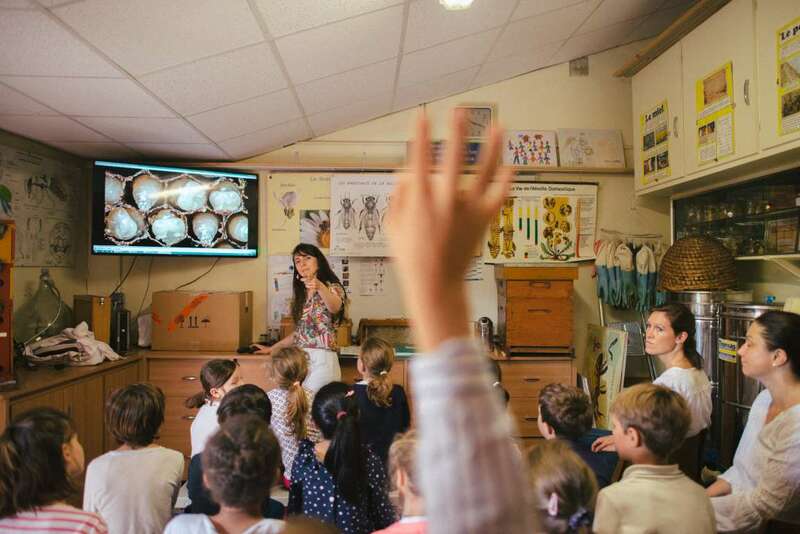 Jamie Lozoff, a beekeeper, during a lesson teaching apiculture skills to children in Paris. If a honeybee were giving a tour of Paris, she might start on the roof of the gilded Opera Garnier, which has been home to hives for three decades. Flying south, she might stop to admire the view from hives overlooking the Place de la Concorde before following the Seine River to the spires of Notre-Dame, where the bee hives, in contrast to the crumbling gargoyles, are thriving. She might wind up at the flower- and shrub-rich Luxembourg Gardens, which has been a honeybee haven for more than 150 years. Over the past decade, Paris, much like London and New York, has seen a notable rise in urban beekeeping. The city of Paris estimates it now has more than 1,000 hives. 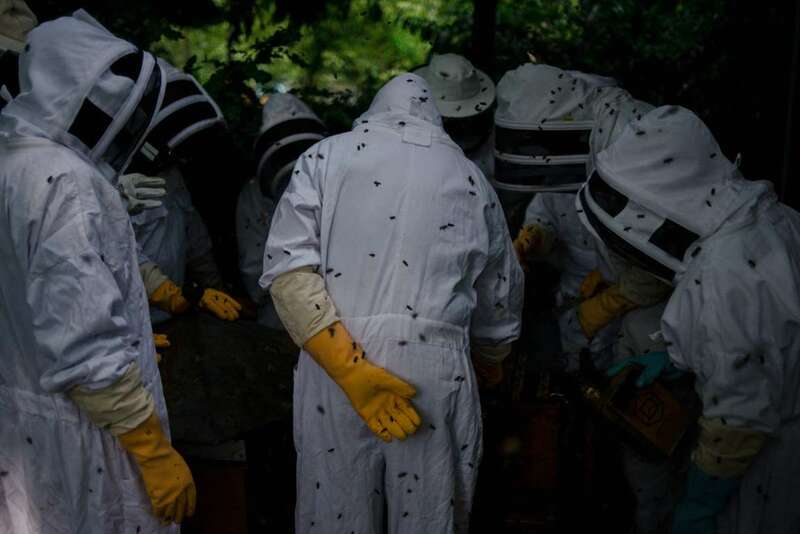 [post_ads]Beekeeping classes held at the Luxembourg Gardens are always fully subscribed, with some 200 people graduating every year, said Marie Laure Legroux of the Central Society for Apiculture, who teaches at the garden. Community gardeners in Paris are now requesting hives from the mayor’s office, which allocates them to gardens and other venues. The number of groups receiving hives has grown gradually since the city wants to ensure the bee population does not outstrip the pollen and nectar provided by the trees and flowers in local parks, gardens and cemeteries. “The bee is the insect the most essential for life on the planet,” said Pénélope Komitès, the assistant mayor in charge of green space, biodiversity, urban agriculture and cemeteries, which are a favorite pollen gathering ground for bees. “Perhaps one reason people now want to keep bees is that it’s a way of participating in the protection of the environment,” she said. But some people become captivated just by watching the bees. Audric de Campeau, a bit of a showman, likes to demonstrate how safe it is to work with bees by eschewing the usual white protective suits and face masks worn by most beekeepers. He even sometimes brings his daughter, 6, with him when he tends his hives, which are on the grounds of and sometimes atop well-known buildings like the École Militaire training school and Le Cordon Bleu cooking school, as well as other major buildings. The environmental benefits of bees are well documented; they’re responsible for pollinating about a third of the world’s food crops. In recent decades, though, their numbers have begun to drop because of pesticide use, predators like the Asian hornet, and commercial agriculture, which uproots flowering weeds, removes hedgerows and cuts down shrubbery to give room to vast fields of grains like wheat and corn, which offer little of interest to bees. The depletion of the bee population in some areas portends a crisis for human beings. Bees have become so scarce in some areas of China that apple and pear farmers are now doing the work of the bees, collecting pollen manually and bringing it from tree to tree. In some European cities, though, bees are faring relatively well. For honey-lovers in Paris that is good news because city honey has a number of advantages, not least among them, according to biologists and life scientists, that it is less likely to be tainted by pesticides. Paris has all but ensured the relative purity of its honey by eliminating the use of pesticides in city parks and gardens, and forbidding pesticides on plantings on home terraces or roofs. Three years ago the city added cemeteries to the list of pesticide-free areas, said Ms. Komitès, the assistant mayor. In Paris the people looking after honeybees range from for-profit entrepreneurs like Mr. de Campeau to students. Some honey bee owners have started rent-a-hive enterprises while others are lone operators. Some large corporations lease hives and pay others to care for the bees and harvest the honey. Many people take up bee keeping as a hobby as Armand Malvezin did some 33 years ago when he was one of the first individuals in Paris to keep honeybees. Like so many others, he found himself hooked on it. Mr. Malvezin has about a half-dozen hives on his balcony and checks on them twice a day, year round, ensuring they are safe from predators and not overcrowded. “It is exactly as if I had a dog,” he said. The bees have come to recognize his smell, he said, and they did not attack him until he began to wear hearing aids. “I made a discovery they could not bear the radio waves that come from the hearing device,” he said. Just a few hives can produce enough honey for use in a restaurant kitchen. On average a single hive produces 55 pounds of honey annually, but it can produce much more or much less depending on various factors. The two-star Michelin restaurant, La Tour D’Argent, keeps hives on its roof to make the honey used in some of its autumn duck dishes and desserts. So does the Mandarin Oriental Hotel. The Opera Garnier sells honey from its hives in its gift shop, and the honey made by the bees atop Notre-Dame is given to the poor. A class at the Luxembourg Gardens apiary and bee school. The number of hives in Paris are capable of producing only a fraction of the honey found in other areas of France, where some beekeepers have scores or even hundreds of hives for industrial-scale honey production. In 2016, the entire Paris region, which includes rural areas outside the city, produced about 324 tons of the country’s total production of 16,000 tons of honey, according to France’s Association of Regional Agricultural Development. The south of France produces the most honey, not surprisingly since the area also grows much of France’s soft fruit and the flowering trees are a rich source of nectar for the bees. The honeybee offering her tour of Paris could just as easily avoid major monuments and show off her city by going to small community gardens, whose neighbors are devoted to their hives. She could also go to several fire houses where the city’s firefighters are cultivating honeybees. And she might end up on the balcony where Mr. Malvezin and his wife, Michèle Bonnefond, lovingly foster their hives, and in the midst of their concrete apartment complex, which itself resembles a hive, make their own honey.